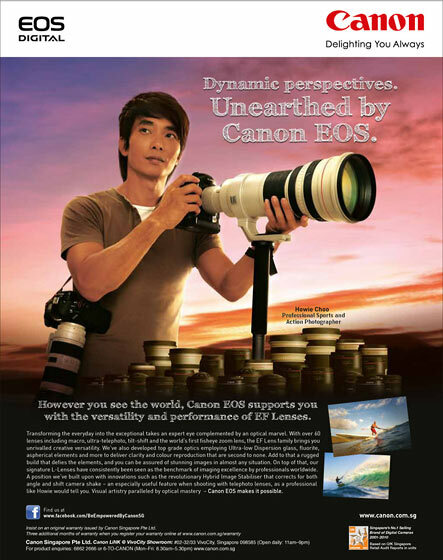 Welcome to Howie Photography, Singapore’s leading professional photography and videography company set up by renowned professional photographer Howie Choo. At Howie Photography, our philosophy is simple: we strive to produce first class top quality work for our clients with passion and dedication. With this guiding principle, plus a dash of creative juice, we have been on assignments that have taken us from helicopters high above Maui water to the rolling waves in Indonesian surf; from the runway of Singapore Changi Airport to production factories in Vietnam. Some of our recent notable work include Changi Airport’s New T4 Project, formal portraits for Government Ministers, the 28th SEA Games sports coverage and the Extreme Sailing BAR Ben Ainslie Team coverage. Over the years, we have been fortunate to have worked for an impressive commercial client list. This includes Changi Airport Group, Robert Walters, Collier International, Motul Asia Pacific, Singapore Management University, Times Publishing, Fast Flow Group / Consulus Group, China Aviation Oil, Singapore Petroleum Company, Euromoney Group UK, GDS International UK, Alpine Motors / General Motors, Singapore Media Academy (a MediaCorp company), J.P. Morgan BAR Ben Ainslie Racing UK, Starboard International, Clipper Race UK, Swimming Australia and Singapore Grand Prix. We also work for major government bodies like the Ministry of Foreign Affairs, Land Transport Authority, Civil Aviation Authority of Singapore, Singapore Sports Council, Singapore Sailing Federation, Public Service Division (Prime Minister’s Office) and the Ministry of Education. In addition, our photos for various clients have regularly found their way into local mainstream newspapers like The Straits Times, TODAY, Business Times and My Paper. Our works have also been published in international renowned magazines such as UK’s “Boards”, USA’s “Windsurfing”, Japan’s “Hi Wind”, UK’s “Kiteworld”, USA’s “Kiteboarding”, “Kite Boarder” from France and “Free” from Germany; local magazines like “iFitness”, “Digital Photographer” and “Pro Digital Imaging”; as well as regional titles like “Action Asia”, “Singapore Business Review” and “Asian Photography”. Named as EOS Photographer of the Year 2013 (Sports Photography) by EOS World, Howie’s work and lens reviews have been regularly featured in the Canon EOS online photography platform. The photos in this web site are just a small collection of our images created over the years. It serves to showcase our style and approach to photography and videography. We sincerely hope that you will enjoy the images and videos presented here as much as we have enjoyed working behind the lens. If you like what you see and think that we can be of service to you, do contact us. We are available for Advertising & Commercial Photography, Portrait and Fashion Photography, Architectural & Interior Photography, Sports and Reportage Photography and Corporate Videography.